Lotions and potions, which natural body care is right for you. Lotions, creams, and potions, oh my! 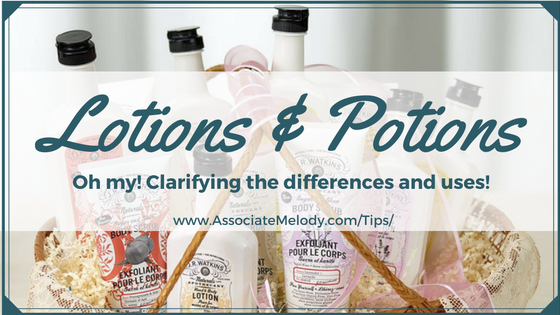 If you’re like me you might need some clarification on the differences and uses for lotions, creams, butters, oils, and salves. There are so many different brands and types of body, bath, and skin care products on the market it’s hard to know which ones to choose. Some are thick and some are thin but which one will fit your needs? I also worry about the ingredients, because our skin is our body’s largest organ and it absorbs whatever we put on it. Keep in mind, every company has their own formulas and definitions. Generally, the thicker the moisturizer the more it will moisturize with the exception being body oils since they are in a liquid form. If you put a dime-sized amount in your hand and hold your hand vertical a lotion will run faster than a cream or butter. Since I’m not a beauty product expert I can only share what I know about my favorite natural skin and body care brand because Watkins body care is what I use. 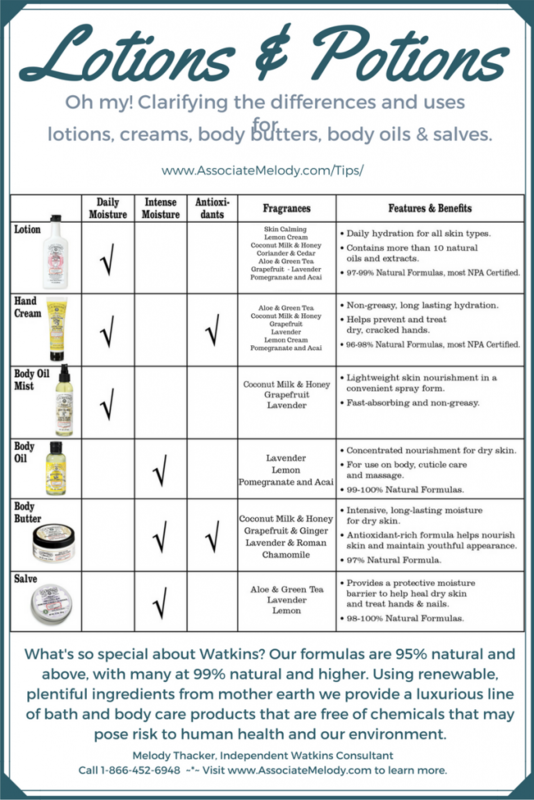 The differences and uses for Watkins lotions, creams, body butters, body oils, and salves. Uses for JR Watkins natural lotions, creams, butters, oils and salves. Hand and body lotions provide great all over skin softening abilities. They are usually a medium thickness, thick enough for rough areas like knees and elbows but thin enough for all over use. They will run but not fast which makes them easy to spread. Learn more about Watkins natural hand and body lotions. Creams have a good moisturizing ability. Hand cream is very good for dry areas such as your hands, heels, elbows, and knees. Just like with lotions, creams can vary slightly in the thickness. Watkins Ultra rich hand cream is more “spreadable” than our hand creams and is able to be used on larger areas like our hand and body lotions. Our Body Butters are more like a cream in look, feel, and spreadability so I would classify them as a thick cream. Very good for spot areas, dry hands and all over use after a shower or bath. Many body butters on the market are the consistency of a hard salve but more lotions and creams are starting to use shea butter which is a major ingredient in our body butter. These are generally hard packed items and the delivery method is via fingertips, rubbing the surface and warming the product. Salves are a barrier balm that will help prevent embedded dirt when gardening or doing other chores. These are very good for extremely dry, spot moisturizing and are excellent for dry, cracked cuticles. Great for night-time use with cotton gloves or socks. Apply the salve to your hands or feet, put on cotton gloves (can be found in drug stores) or thin cotton socks (white) and you’d be amazed how soft your skin will be in the morning. This is great for those who suffer from cracked heels. Our hand and cuticle salves have more “healing” abilities and form a moisture barrier. Watkins body oil mist is quite unique as there are few other “body oils” on the market that are comparable. Body oil mists are best used after a bath or shower while the skin is wet. They are sprayed on and rubbed into your damp skin and provide a moisture barrier. This type of oil is classified as a “dry oil” because the formula allows it to be absorbed quickly into the skin, and leaves a silky soft, not oily feel to the skin. They can also be used as a bath oil. They contain Vitamin E and are great for preventing stretch marks. These oils have great anti-aging properties. Watkins body oil mist is my personal favorite because I don’t like body care that leaves my skin oily or greasy. I’m an Independent Watkins Consultant so when you purchase through my links I will earn a commission. I love and appreciate my customers. I hope this article helps you figure out what the differences are so you can decide which Watkins lotion, cream, body butter, body oil, and/or salve will best fit your needs. I need insect repellent in the cream . Need insect repellent in the cream . Hi Lynne, thanks for letting me know. I’ll send you an email with information about our insect repellent lotion or you’re welcome to call me toll-free at 866-452-6948.